Tankless water heaters have been around for a long time by now. They are particularly handy because they save energy, mainly due to the fact that they do not take up any electricity when there is no need for it. Once the water reaches a certain temperature, it would stand this way because the heater is designed in a way which would retain the heat. Today’s tankless water heaters are designed using modern computer appliances that would control and retain the temperature at a degree you set up. 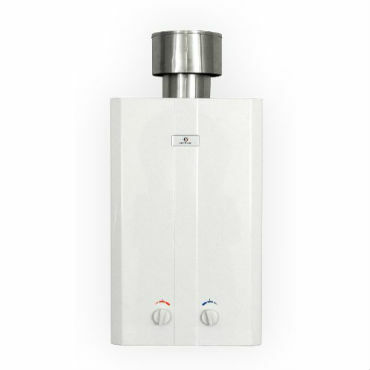 Another thing that you should take into proper account is that tankless water heaters are incredibly safe. Their burners would only turn on if hot water is needed. 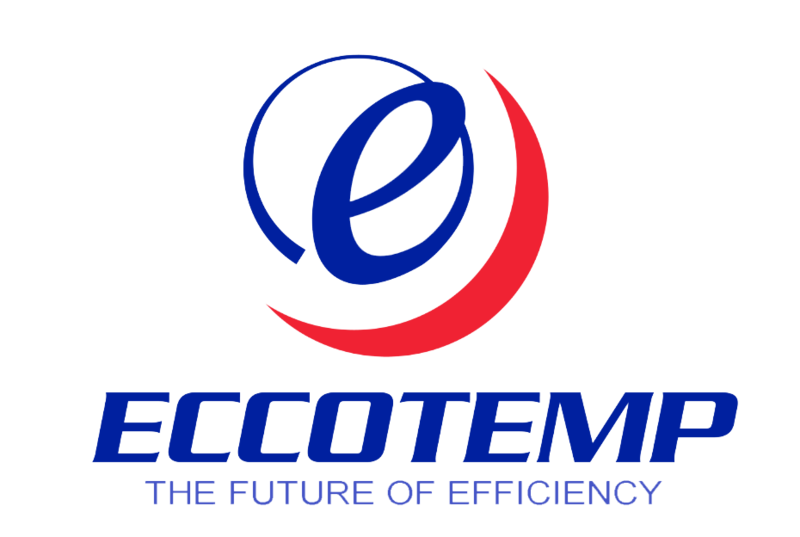 We have compiled a list composed of Eccotemp tankless water heaters reviews that would enable you to properly choose the best model that would suit your particular needs. The Eccotemp L5 is a Portable Tankless Water Heater and an Outdoor Shower. It uses liquid propane fuel and a 2D cell battery ignition system. The minimum flow rate is about 0.3 liters per minute and it only needs between 20 and 80 PSI of water pressure. This particular water heater is 14.5 x 11.5 x 4.5 inches in sizes which make it incredibly compact and easily installable in small places. A perfect place for it would be under your outdoor sink. This particular unit is not designed to be inside because it isn’t properly vented to be working in an enclosed space. The product is especially handy if you live in an area in which electricity blackouts occur a lot as this water heater is running on propane fuel and is independent when it comes to electricity. Eccotemp L10 is a Portable Outdoor Tankless Water Heater which includes a 9’ CSA certified gas regulator. It also has a stainless still rain cap and 1/2” NPT to garden hose adapter. It also has a 20-minute safety shutoff timer that would reset when the water stops and would start again afterward. 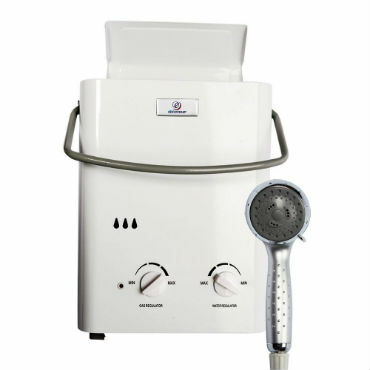 It can be used if the temperatures drop to a freezing point but you would have to start the water and turn on the water heater when it is below freezing temperature. However, don’t forget to drain it as soon as the unit cools off in order to protect the coils. This particular water heater could easily fill up a bathtub of hot water as long as you don’t run out of propane as this is the source it is running on. You could also use it in an RV to ensure you have enough hot water supplies to last you through the journey. 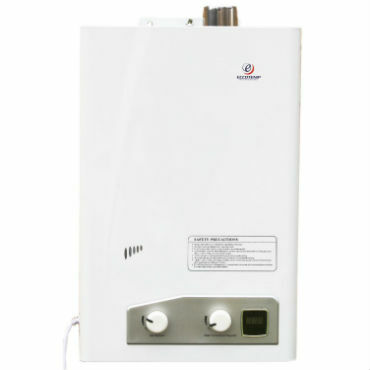 Eccotemp FVI-12 is a high capacity propane tankless water heater that has 1/2” fittings and sleek modern design. It also has power ventilation for safety and efficiency purposes. A digital temperature display is available as well as fully independent gas and water controls. The maximum achievable temperature would depend on the temperature at which the incoming water is flowing in. Normally the device would be able to heat up the water at about 55 degrees more than the temperature it has come in. Depending on your demand, this unit could probably handle the supply of hot water for your shower, sink, and dishwasher if used simultaneously. Unfortunately, the unit can’t be installed in a habited space because it needs fresh air to burn. Also, make sure that if you install it out in the open you ensure some sort of a cover because this device has a lot of electronic components that shouldn’t get wet. 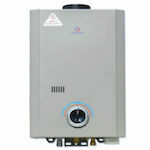 Now, this is a tankless water heater that includes a CSA regulator for a standard use with 20-Pound grill propane tank. It has a battery igniter that allows you to be completely independent of electricity sources. This would entail that you can easily turn it on even if you currently have no electricity. It has an on and off chrome shower head and a garden hose adapter. The ideal operating range of this portable tankless water heater is between 20 and 80 PSI. Depending on the water that is going in the tank, this water heater could easily reach temperatures between 50 and 125 degrees Fahrenheit. It could fit perfectly in your cabin, however, it is advisable that you cover it with something in order to prevent rain and unwanted elements getting in. Even though it is unlikely, this may be the cause of some problems. 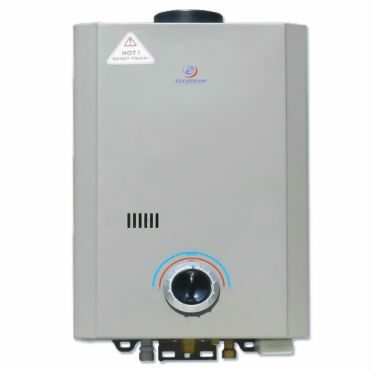 This is an Outdoor Natural Gas Tankless Water heater that comes with 5 years of manufacturer warranty on the parts and 10 years on the heat exchanger. It has an 110-volt power supply and a flow rate of 6.8 GPM at 35-degree rise. It also has a built-in antifreeze circuit. As you can imagine it is cost-efficient because it is operating on gas and it doesn’t consume any electricity at all. It only turns itself on when it needs to heat water and stays off during the other time. 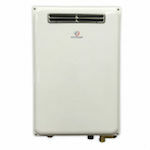 This portable tankless water heater is ideal for a 3 bedroom home with two baths. If you are able to install it outdoors you won’t even have to spend extra money on ventilation pipes. It only weighs 38 pounds and its sizes – 22 x 15 x 6 inches make it the perfect compact water heater that is easily fit in small spaces. The biggest advantage of the Eccotemp tankless water heater is that it is an undeniably energy-efficient source of hot water. The fact that these particular devices would only work when water needs to get heated is incredibly beneficial. This would allow you to save a lot of money on your electricity bills. Some of the heaters offered by this brand operate solely on gas that would enable you to rely on them if an eventual electricity blackout occurs. They are also easy to use and could allow you to use them in RVs and ensure that you have enough constant flow of hot water. It is also very safe because they use electronic ignitions systems which don’t produce any flame. Nevertheless, there is inevitably a negative side to the Eccotemp water heaters as well. Most of the units they offer come in rather small sizes and proportions because they are generally designated to be installed in small spaces. This makes them rather inefficient if few people want to take a shower at once, for instance, or if the washing machine is working at the same time. This may result in a shortage of hot water because the heater won’t be able to catch up on the demand. However, if your particular situation puts you in a position in which you are required to utilize such a device, make sure to go through some of the Eccotemp tankless water heater reviews in order to make a concise and informed choice. There is a great abundance of units you could purchase. Tankless water heaters could easily solve your hot water problems at a reasonable price. Most of them won’t require a lot of maintenance thus ensuring you don’t have to waste additional time. The Eccotemp units are completely automated and the only thing you would have to do is to set the temperature at which you want the water to be. The rest would be taken care of by the water heater. Modern water heaters use more complex computer appliances that would regulate the process in the device automatically and you wouldn’t have to worry about it at all. Nevertheless, don’t put too much expectation. You have to keep in mind that a single unit of this kind probably won’t be able to supply you with all the amount of water you need, especially if you have high demands for hot water. For other brands of tankless water heaters, read our reviews of Eemax, Bosch, Bradford and Rinnai. These kinds of devices are normally set out for emergency situations and they shouldn’t be your main source of water. Of course, you could always install numerous devices, thus eliminating the problem at hand, but then you run the risk of them not being as efficient as they are intended to be.